24th September, Ashgabat: Third-seed, Zhang Yuhong and Zhang Chunli of China denied a strong Korean pair their third gold medal at the 5th Asian Indoor & Martial Arts Games by defeating them, 457-407 in the Women's Doubles final. 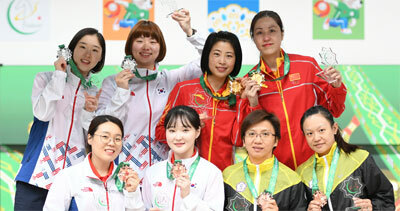 Both Chungli and Singles bronze medallist, Yuhong bowled clean games of 224 and 233 respectively to beat the Korean fourth-seed of Hong Hae Ni and Singles gold medallist, Baek Sung Ja for the gold. Baek posted 225 while her partner Hong managed only 182. The Chinese pair had earlier eliminated their neighbour and third-seed, Chinese Taipei, 404-365 in the semi-final match to advance to the final. 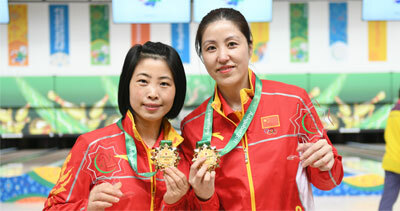 Pang Yu-Fen rolled 192 and Wang Ya-Ting 173 to earn the bronze medal. Hong and Baek dispatched their team-mates and top seed, Kim Moon Jeong and Jung Da Wun, 429-397 in the all-Korean semi-final match to face the Chinese pair. The champion took out sixth-seed, Aldila Indryati and Singles silver medallist, Tannya Roumimper of Indonesia, 443-394 in the quarter-finals to advance to the semi. Hong and Baek eliminated Hong Kong's pair of Milki Ng and Chan Shuk Han, 401-369 in the quarter-finals. Top seed Kim and Jung ousted eighth-seed, Alexis Sy and Lara Posadas of Philippines, 470-429 in their quarter-final match while the Chinese Taipei pair defeated another Filipina pair of Liza Del Rosario and Krizziah Tabora, 445-413 in the quarter-final encounter. The earlier 6-games preliminaries saw the first Korean pair topping the field with 2610, 83 pins ahead of Chinese Taipei, who totaled 2537. China posted 2495 for third and the second Korean pair fourth with 2439. Hong Kong finished fifth, just two pins behind on 2437. Indonesia was sixth with 2418, Two Philippine pairs made the cut for the quarter-finals in seventh and eighth positions with 2387 and 2349 respectively. The second Chinese pair of Peng Rui and Yang Liyan missed the cut by 28 pins in ninth position. Competition will shift to the Team of Four events for both the men and the women divisions which will be contested tomorrow over two blocks of three games each, the first block in the morning and the second block in the afternoon. The top 4 men and top 4 women teams will qualify for the semi-final shootout on September 26 and the winners of the semi-final matches will meet in the final to be held on Septmber 27 ending the week long bowling competition. Photos by Terence Yaw in Ashgabat, Turkmenistan.